Throughout the twentieth century, nearly every episode of Armenian history had a Dashnak and an anti-Dashnak version. The life of Dramistat Kanayan, more commonly known as General Dro, was no exception, especially where his actions in Germany during World War II were concerned. As was revealed publicly right after the war ended, Dro and several other Dashnak notables, with no known formal party sanction, made overtures to the Nazi high command and formed an Armenian Legion to assist the German regime. Other Armenians were also involved with the Nazis. What did they do, and why did they do it? Ambiguities have lingered. 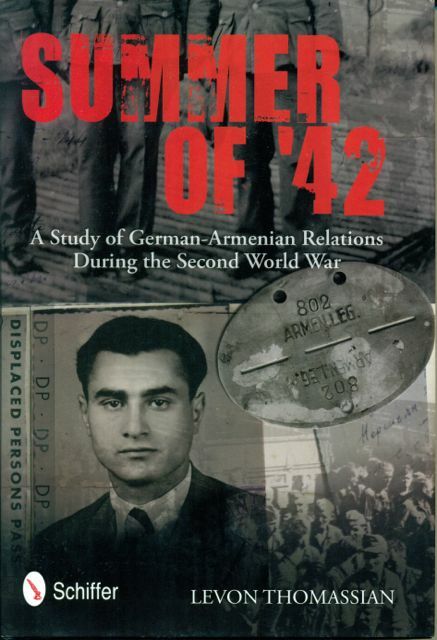 Levon Thomassian’s Summer of ’42: A Study of German-Armenian Relations During the Second World War (Schiffer Military History, 2012), recently acquired by the Zohrab Center, does not wipe away all of the ambiguities, but that’s not the author’s fault: the realities are ambiguous. In this exhaustively researched scholarly study of Armenian wartime actions in Germany, Thomassian sheds considerable light on the actions of General Dro and others. In the process, he finds that elements of both a desire to protect Armenians from being among those targeted for mass murder (a very real possibility, given the regime’s racial theories) and the hope of being on the winning side of the war to pry Armenia loose from Soviet rule may well have influenced Dro’s actions. But Dro is just one component of this book’s focus. Thomassian also shows the dilemmas that many Armenian prisoners of war faced after their capture by Nazi troops, with the prospects of saving their own lives by serving in Nazi forces. With the occasional exception here and there, Armenians decidedly did not like Hitler—nor, Thomassian also convincingly shows, did Hitler particularly like them. Thomassian also makes clear that the Armenian contribution to the Nazi war effort was minuscule compared with the Armenian contribution to the victory of the Allies. General Dro is, by any academic standards, an important historical figure in the twentieth-century Armenian experience. A work detailing his actions which is neither hagiographical nor prosecutorial should be greatly valued, one among many reasons to read Levon Thomassian’s Summer of ’42. Of equal importance is his fair and probing treatment of Armenians in general, who were caught, as they had been before, in fateful circumstances and had to make impossible choices in response to them. Professor Alexander is a New York-based historian of Armenian-American immigrant experiences. His research brings him frequently to the Zohrab Center, where is also assists as a consultant.